No one intentionally aims to rank in second position. In fact, the desire to excel begins surprising young. For most people, expectations to consistently rank in top place is unrealistic. Is there ever a time when second is actually an advantage? Can second be best after all? I have a lot of experience at second place! I was second oldest among my siblings. Scholastically I worked hard to achieve good grades, sometimes even coming in second best. At track meets the majority of ribbons earned were red, the reward for second. I even entered a writing competition in grade school. You guessed it — second place! “Whatever is worth doing is worth doing right,” was my father’s motto for excellence. He was right! It is always a good practise to aim at doing our best. Often our best efforts don’t get us to the finish line the fastest, merit the achievement we hoped, or gain academic excellence. Then what? Jacob’s firstborn, and the one who should have received the birthright, was Reuben. But God rejected him for committing adultery with his father’s concubine. Simeon and Levi in vengeful anger annihilated an entire village. They too were checked off the list of eligible candidates for first place. Jacob preferred Joseph’s son Ephraim for the honour of top choice. But God saw things differently! Why was Ephraim rejected as “first choice”? His name means “double fruitfulness“! What is more, the tribe of Ephraim was acclaimed for their skilled and mighty warriors. (1 Chron 12:30) Sounds like a top qualifier to me! As we follow history, we see Ephraim’s descendants become overly proud of their abilities. On several occasions, they were more than a little upset about being excluded from battle or shunned from being chosen first. Pride, rebellion and disobedience enjoy cohabitation. The tribe of Ephraim accepted this ugly triad which ultimately led them away from God. But why did God choose Judah? Judah was Jacob’s fourth son from his first wife Leah — the wife he did not love. Jacob had two wives, two concubines, 12 sons and a daughter. To describe family life as dysfunctional would be a gross understatement! In comparison to his older brothers, Judah would never be considered “righteous”. He had his own set of deviant behaviours! So why Judah? Maybe, his mother started it! he enabled her to conceive, but Rachel remained childless. Leah became pregnant and gave birth to a son. “It is because the Lord has seen my misery. So she named him Simeon. So he was named Levi. Second place is one thing; second place to a younger sister is unbearable. Especially when you share the same husband! Leah did everything she could to earn her husband’s favour. Nothing worked! She somehow reconciled herself to ever-present rejection, dwelling in the land of unloved. Only those who have experienced such an agonizing existence, can appreciate her brave strength to praise God in the midst of her unending storm of pain. Sacrificial praise extended in the midst of unbearable grief! Leah gave birth to more than a son. She brought forth undaunted worship, courageously choosing to turn her gaze away from people to God, Adonai, her Lord. Judah’s birth was a turning point for Leah. Follow the family tree down a few generations and we come to David. When the Israelites demanded a king, God agreed and sent Samuel to anoint Saul as the first king to rule over his people. (1 Sam 10) Saul, however, proved himself unfaithful being far more concerned with what people were thinking about him than how he stood before God. David’s father, Jesse, didn’t consider his young son even a remote possibility when Samuel came to anoint the future king. But God saw in David the perfect candidate to lead his people. Undeniably, David as second king exceeding the first! The disciples felt an urgency to replace Judas Iscariot. They prayed, cast lots, and confidently chose Matthias. (Acts 1:24-26) God’s choice wasn’t on their list of applicants — Saul of Tarsus! The persecutor of the church, murderer of men, women and children? Saul? Yep, Saul! After Judas the traitor, Saul didn’t appear to be any step up, but he was. The second ultimately became the greatest Apostle of all, planting many churches and writing a large chunk of the New Testament. 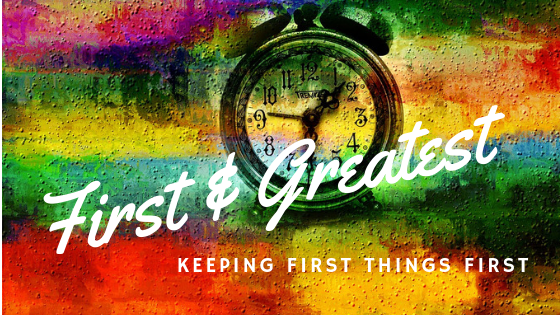 There is One “second” who is even greater. His name is Jesus. Jesus? Second? How could the Lord of all possibly be second? The first Adam sinned in the garden gaining for all mankind death while losing most everything else. Through his death and resurrection, the second Adam, Jesus, restored all the first forfeited. “But thanks be to God! After reading this, I know beyond a doubt that sometimes second so far exceeds the first, it is unbelievable to conceive it was ever second. In fact, Jesus was always God’s first plan, His only plan, His best plan. 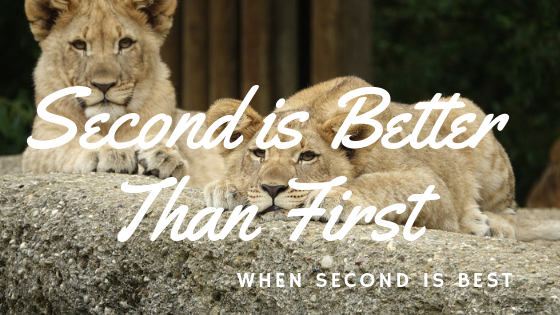 Can second be best after all? Absolutely!